The electric starter on Kohler lawn mower engines is both a convenience and a necessity. The additional torque and compression of larger Kohler engines make it difficult to start them with traditional pull-ropes. Starters mount onto the engine block with a bendix gear positioned in such a way that it engages and spins the engine flywheel when energized. The starter solenoid serves as a relay between the lawn mower's battery and the engine starter. By turning the ignition key, the solenoid is in effect “given permission” to apply battery power to the starter motor to crank the engine. If the solenoid is suspect, troubleshoot it to confirm whether it is bad. Clean the terminal posts on the starter solenoid. The solenoid mounts on the frame of the mower, near the engine starter. A red battery lead mounts to one of the solenoid terminals, while a second lead connects the solenoid to the engine starter. Test the battery lead for adequate voltage using a voltage-ohm meter. 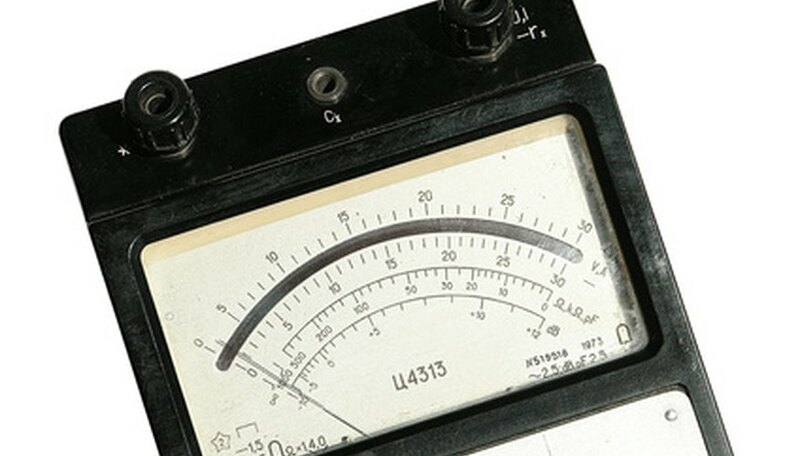 Adjust the meter to read DC voltage. Place the red lead onto the terminal of the solenoid connected directly to the battery. Place the black lead of the meter on the lawn mower’s frame as a ground reference. The voltage must read between 10 and 14 volts. If the voltage is lower than this, check and charge the battery before proceeding. Connect a jumper lead to the solenoid terminal on the battery side of the switch. The lead runs directly from the battery to this terminal. Touch the other end of the jumper to the starter terminal post. If the engine attempts to start, the solenoid is bad and replacement with an identical replacement is necessary. If the starter does not rotate, the problem lies with the starter. Verify the battery charge again before spending the time and expense of replacing the starter. Clean the battery posts and terminals with a wire brush to ensure a positive connection for current flow. Ensure the battery ground terminal is properly attached to the lawn mower frame.